A child of the true West, Augusta became recognized as one of the greatest Western painters. Raised on a homestead in “No Man’s Land” in Oklahoma Indian Territory, she never attended a school or had an art lesson. 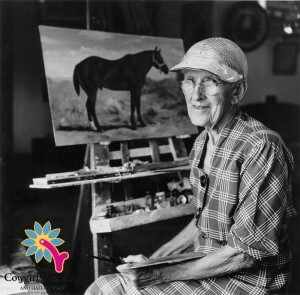 In 1911, Augusta won first prize in the state fair for a painting, beginning a long string of awards and accolades for her work. A courageous pioneer, Alice recorded life of the early West as vividly as any writer.